Clematis at our last house. I have been in this new townhouse for two full years now. Having just a small area at the back that although it comes under "common" area in the townhouse rules, also bears the significant title of my "exclusive use" area. This excuslive use is about 12 feet out and 30 feet across; and you dare not go beyond. A slight exaggeration on my part. In this area my step -son built us a deck that goes three quarters of the way across the allotted space, as I wanted to keep a small area for a bit of gardening, giving me a bit of colour besides the railing planters on the deck. Last year I started out slowly adding a couple of shrubs and a perennial or two, deciding the rest would be annuals. This year I tweaked everything a little bit and decided to add a clematis by the stairs that come down from the deck to this little garden area. I picked the perfect spot and I purchased a nice little decorative iron structure that the clematis could climb on against the outside of the deck and trail along the railing at that area. 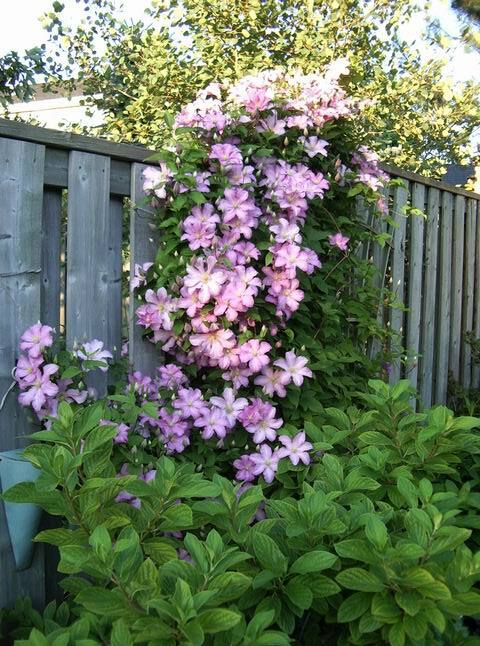 Of course I had visions of the clematis that we had at our last house that not only gave us a beautiful show, but also graced the next door neighbour's backyard by trailing through and over the fence. 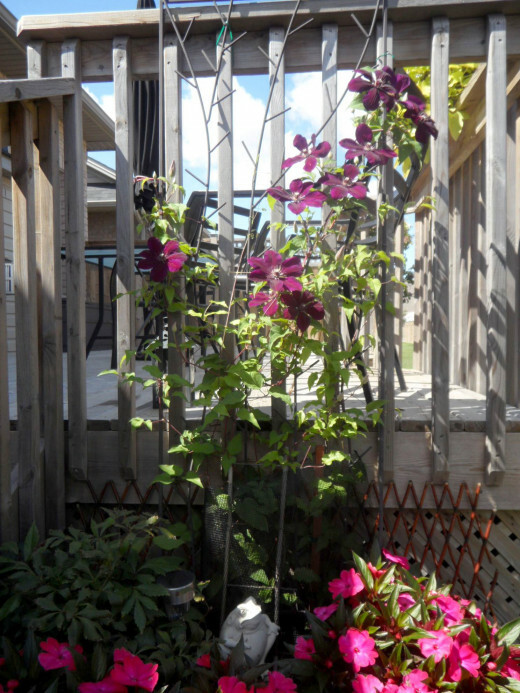 So as I said, I had visions of this clematis eventually becoming like others I had, and in this particular house trailing all along the railing and dropping down the inside of the deck to be admired while sitting at the patio table. This is because I had exactly this kind of scenario at another house, not the last one, but the one before. We did move around a bit as you can tell. Before long I noticed the plant taking quite nicely and starting to cling to the iron structure helped along by the stake it was hanging on to for dear life in the pot it came in. Every couple of days I would look at it and started to see it rise about a quarter of the way up. As well I noticed a few buds appearing. Then one day I went out to find the leaves all wilted and dried up looking. What the heck. As I poked around removing the debris a whole stem came off in my hands. Something has been cutting this off at the bottom. And then I remembered the darling little rabbit/rrabbits I have see scampering away whenever I come out the patio door. Alright, OK - I can fix this. I removed all the dead stuff and knowing that it surely still has good roots, and it is still early enough in the season to rise once again, I go out and purchase some screening to put across the front of it so that the rabbit can't get at it. Up it comes again. This time I decded to also add a second Clematis of a different colour next to this one in a lighter colour, more like the one we had at the last house. Next thing I know this poor clematis, the original burgundy coloured one has been eaten off again, but never mind the paler one is climbing like crazy and I am happy because it shows real promise. Meanwhile the lady behind me is feeding all the birds and we have flocks of birds all over the place. Doves in pairs making at least 8 that I opened my door to one morning; of course they all took off leaving their poop behind on the railing. Now don't get me wrong, I love birds and indeed at the last house my husband and I fed birds too. But we only fed the finches in the summer and the other birds during winter. I had always understood that it was not a good idea to feed the birds through summer, although I could be wrong here. Anyway we are in a close community here, so you can see what's happening. I find out she is not only feeding the birds, but she is feeding the rabbits too. I am not really surprised because she,as well as my step-daughter was a little dissapointed with me for not saving baby mice that were found in my BBQ just a couple of weeks before. That's another hub: "What's That In My BBQ". One morning I went outside to water my little garden and I notice little baby carrots in front of my garden where the clematis is. My neighbour appeared at her railing saying "Good Morning" and then announced that she had thrown the carrots over because she saw the rabbit there and didn't want him eating my flowers. Uh-Huh - OK! - now I have baby carrots gracing my garden. She's trying I know, and she loves doing all this - but jeepers. Anyway and in the meantime, this new clematis had found its way all the way to the top of the railing and there were about a dozen pale lavender flowers all nodding their heads in the breeze on top of my railing. It was really pretty to see looking out from my great room. This lasted for a few days and then one day I looked out and saw they were all wilted. Now, it had been very very hot, but I had been watering every day. So how can this happen? I'll tell you how it happened. That cute little rabbit had once again chewed at the bottom and killed the whole plant. Totally frustrated now, I once again cleaned away the dead foliage and stems and found that it was destroyed right down to the ground, but alas of course I could see a bit of green there at the tip. Truthfully I was at the end of my patience with this whole thing, but thought "well at least I'll put something behind the plant and in between the deck this time to block the little darling from the back end of the plant. Everything in place now, I left the plant and truthfully could have cared less by this time, thinking I'll work harder at it next spring to make sure it is more protected. After a few days I noticed it growing again and then a few more leaves appeared. Quite frankly I didn't bother with it at all any more except to water it when I was outside. About a week ago I noticed it was about three quarters of the way up the trellis, and noticed what looked like a few buds forming. I had not been out there in the last few days and then we had a lot of rain, so was not out there at all. This morning I went out and couldn't believe it. 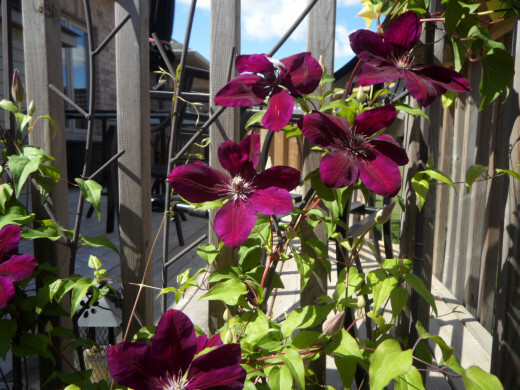 The burgundy clematis is climbing once again and has about a dozen beautiful flowers on it. There is no sign of the lavender one, but this clematis has succumbed three times and fought its way back. I really do think it deserves a medal! In the meantime I have heard different views on how to keep the rabbits away from your garden. One is to dig in bloodmeal around the plant. 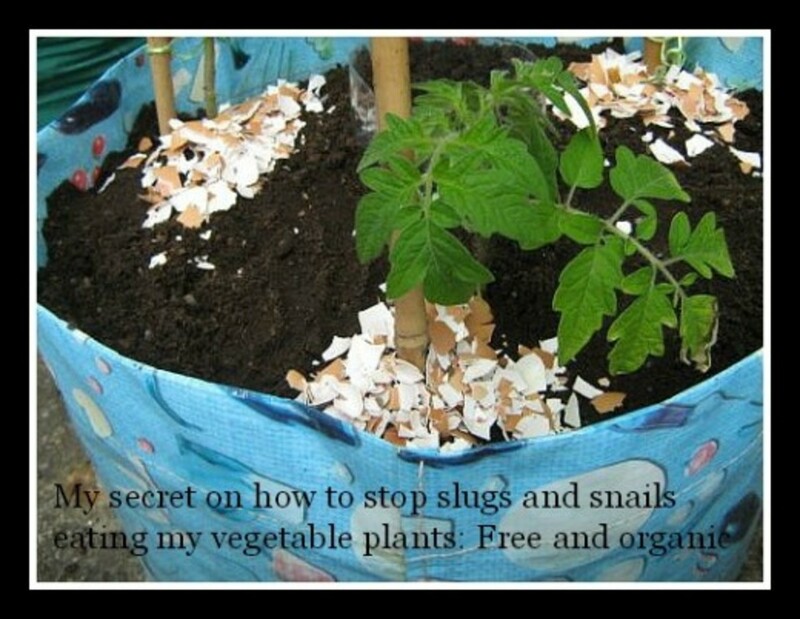 I had planned to try that next spring, but then my neighbour just told me that she heard shavings of Ivory soap does the trick too. Who knows? I'll find out next spring and summer. That's true whonu - the will to survive. Sometimes it works and sometimes, well it doesn't - but all still have the will. The special flower well represents the will and determination that each of us has inside and when we need it, it is there. Nice work and thanks for sharing. Thanks for reading and thanks for the tip. I had never heard of mosquito plant, but have bought the citronella plant before. Thanks again. 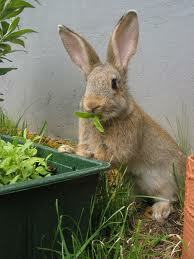 Yes, darling little rabbits scampering around... Chipmunks and squirrels are no better for our plants! Bravo to your burgundy clematis! By next year, you'll have enough advice on this hub to solve the pest problem and you'll be growing all the varieties you desire. BTW, I grow mosquito plant (like citronella plant). After not being able to grow sunflowers because the pests would eat the young plants before they could grow I started planting the new plants with crushed mosquito plant leaves and sprinkling the same around the plants. Works beautifully and couldn't be a more natural repellant!